Just by taking a roundup of full tutorial for this pallet deck you can have all the answers of questions rising in your mind! 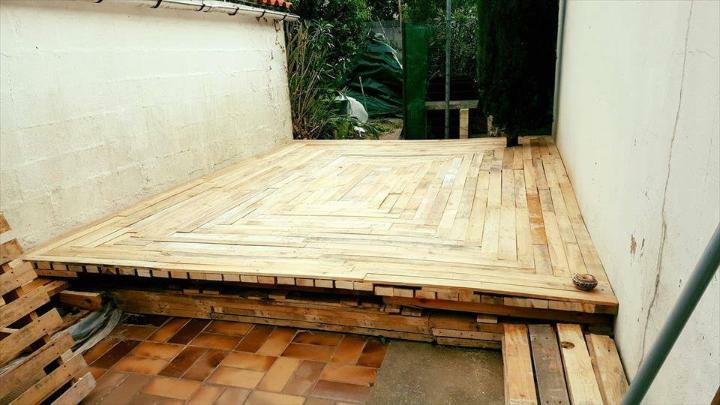 Just go with pallets and do the thousand-dollar home improvement projects all for free and this pallet deck project is also highly budget-friendly! 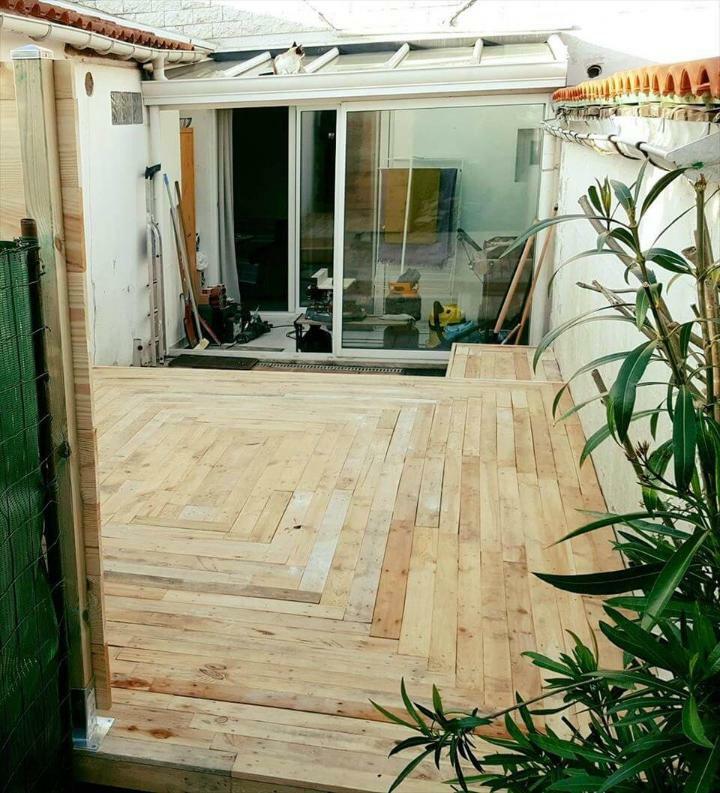 The top deck floor has been done to have a visually pleasing square pattern and there is also a mini wall and some stair steps installed with pallets! 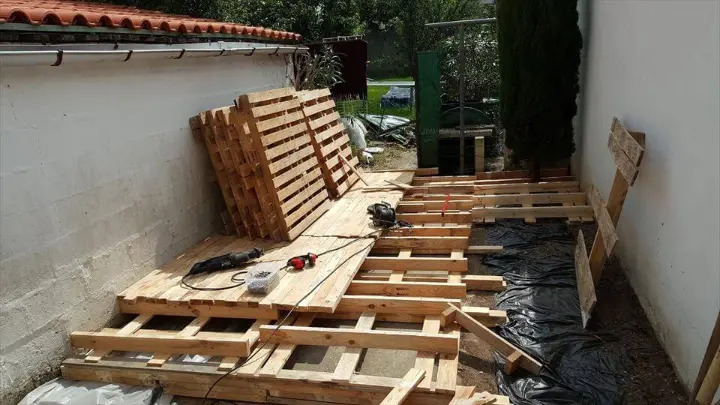 An ideal outdoor sitting location must have the ideal weather conditions too, so it is surely going to be a first step to decide the location while doing this pallet deck project! 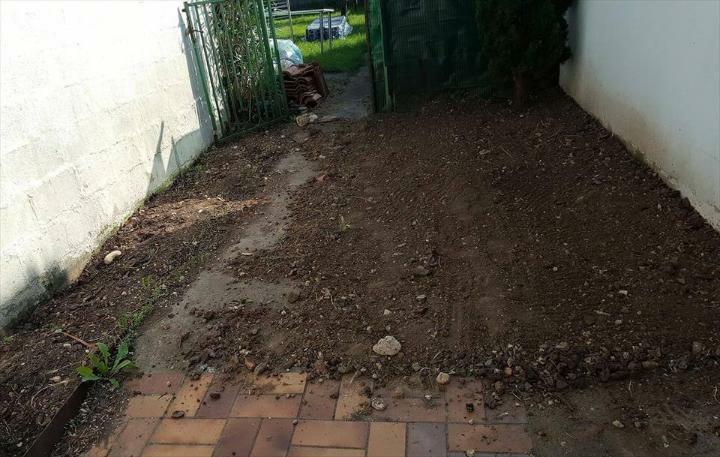 Once you have decided the location just level it up by using leveling tools and also by adding and removing more soil where necessary! 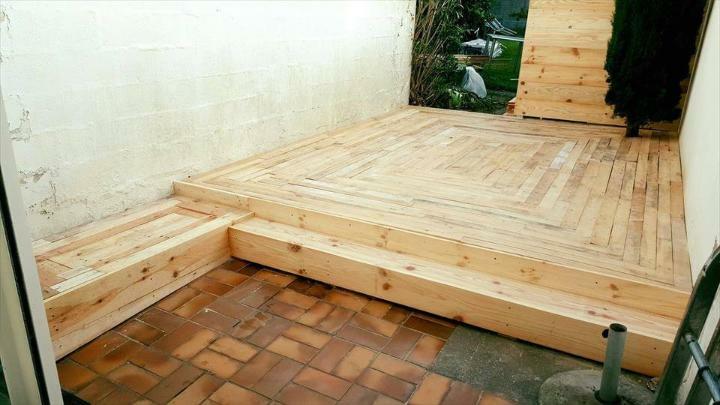 First of all remove the deck boards from the pallet skids and use the remaining part as a unit for installation of primary base of the deck! 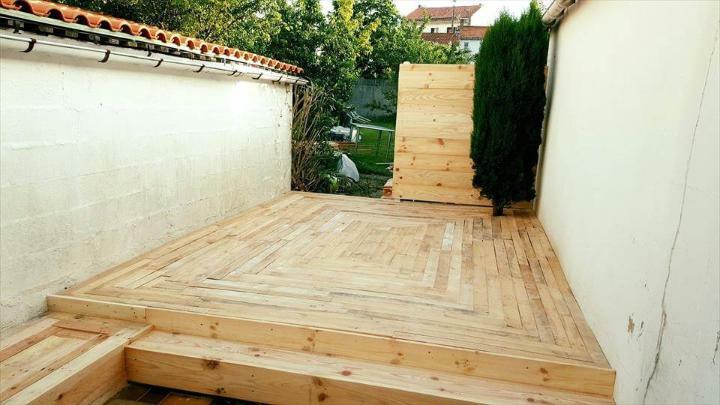 Do add the floor underlay fabric or cloth first before you add the pallet-made units for deck construction! Keep on sanding and assembling and leveling every time you make the new additions! The top layer is must here to be filled with those removed pallet lengths or deck boards, Just add them one by one for whole neat and precise covering of bottom layer and here it has been decided to go with the 3 layers and last one here is to be done with patterned packing of pallet slats just for stunning and bewitching wooden flooring! After installing the 2nd layer the top layer has been installed for a patterned behavior of the top deck floor and here it has been decided to go with square pattern so pallet slats have been filled accordingly as you can see! Final step would be a complete overhauling and installation of side mini wood wall and stair steps, so do the final repairs and just finish the deck up for family gatherings there for sitting and gossips! The edged part of the deck has been gained just for decorative affairs as you can put there the lovely garden pots or vases for amazing garnishing of entire deck for an all stimulating sitting ambiance! 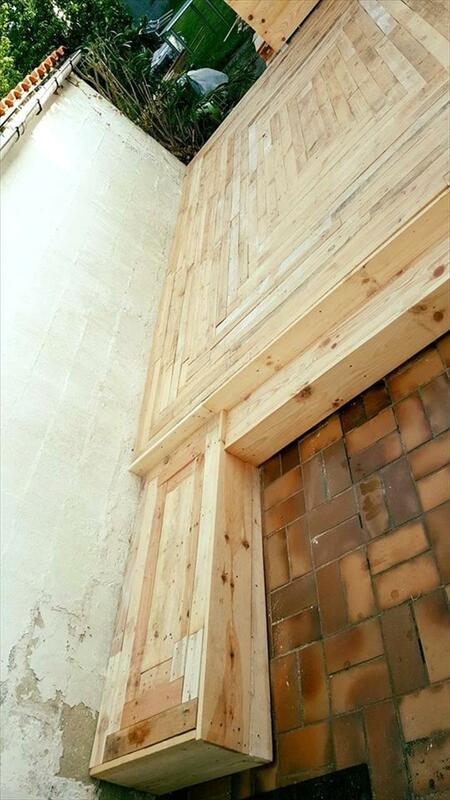 Here is preview of opposite side and you can also install a custom gate here just for security and privacy and it is also too easy to build custom gates, doors or windows with pallets! Just protect the whole deck from extreme outdoor climates which may damage the wood early, by applying the stain coats and also bring the shine on wood grains through varnish or water base poly coats! After applying the final protective coats, the deck would be all ready to be organized and you can get the custom seats, L-shape sofa sets and benches there for a great sitting time! 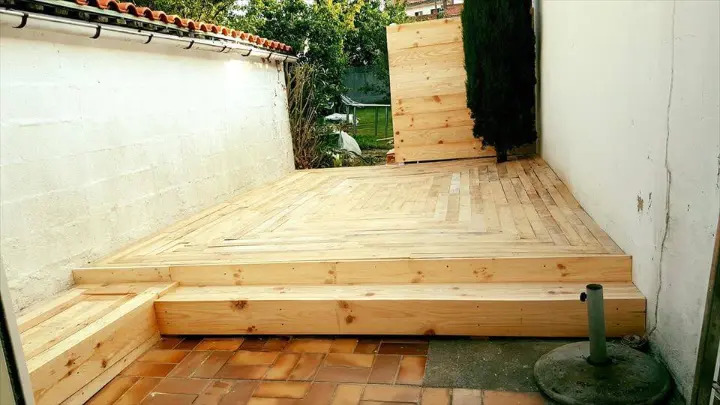 You can install also the poolside deck and garden deck with pallets by going in the same way and this is how you can make your home look ideal without getting expensive, avail the all in one solution, the recycling of pallets! 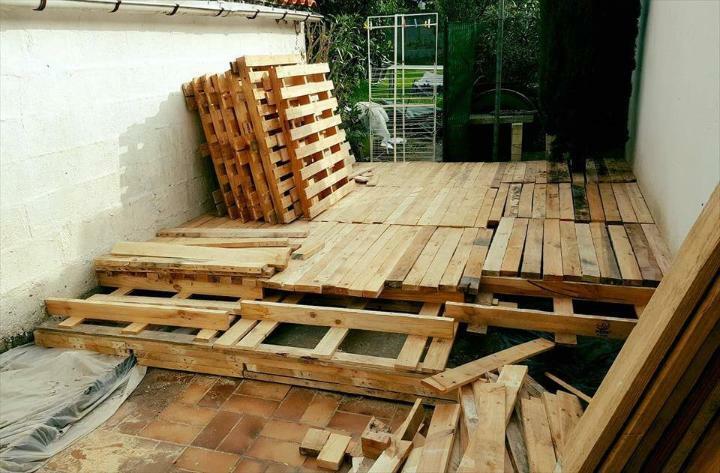 You can also build the all the sitting sets for your decks with pallets!